Alright, so I loved this book, but I kind of hate that I did because it’s actually, objectively, a lot of things that I hate. Mostly, The Devil You Know is just not nearly as clever an idea as the author seems to think it is. Still, I just ate it up, and I tore through this little book in the space of an afternoon, it was so much fun. K.J. Parker has taken an idea that has been done before and freshens it up just the right amount, but without making it overly precious or smugly faux-intellectual. 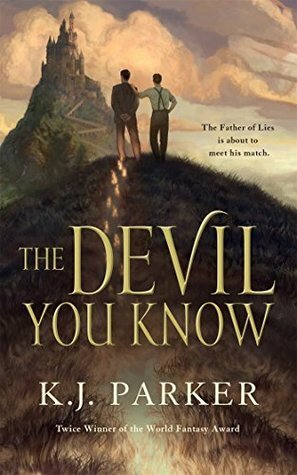 The Devil You Know takes the unreliable narrator trope and multiplies it by two, telling its story from the twin perspectives of an actual (if unnamed) devil and the great philosopher, Saloninus. While there are a couple of point of view shifts that were easily missed—to the point I had to go back and reread once or twice—this mostly works. Saloninus in particular is a wildly clever and funny character, and the contrast between his confidence and the increasingly worried tones of his devil servant is consistently hilarious enough to make up for some of the story’s shortcomings. The biggest problem that I had with The Devil You Know was the way that women were treated in the narrative. For one thing, there are no actual female characters in this book. There are hordes of nameless prostitutes, shipped in to entertain the menfolk, and there is the woman presumed to be Saloninus’s ex-wife. The sheer lack of agency and importance of these women isn’t particularly surprising, but the way in which both Saloninus and his devil callously use women makes it difficult to truly root for either of them. It’s one thing to have a story with few or no women, but it’s something else entirely to have two essentially misogynistic point of view characters and expect them to be universally appealing. Regardless, I rather found myself liking both Saloninus and his devil in spite of myself. Saloninus is a wonderfully wicked and manipulative character, but he is only human. The devil has the air of a sort of harried bureaucrat. His anxiety about the contract with Saloninus is palpable, and it’s highly entertaining to experience the devil’s warring feelings about the philosopher. Neither character is particularly compelling, and they definitely aren’t breaking any new ground, but they are both better-than-middling examples of their types. While the story’s ending is somewhat telegraphed and certainly not very original, Parker manages to mostly make it work. It wraps up a little too quickly and neatly, if anything, and it would have been nice to see things go down in a way that was a little less expected. However, it’s a solidly entertaining story that one doesn’t have to think too hard about. Sometimes, that’s good enough, and this is one of those times. This review is based upon a free advance copy of the book received through NetGalley.